Susanna putting a varnish finish on the second toy box for her preschool. Today was a good workshop day. Normally workshop time is alone time, but sometimes it is nice to have company. 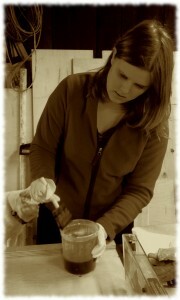 While, I did get most of the day alone in the shop, Susanna joined me after she came home from work. I had put the first coat of varnish on the toy box last night, and she sanded and put the second coat on this afternoon (while I glued up the charging station). I took the morning to get started on the charging station for the new mud/laundry room. Our kitchen counter is a tangled mess most of the time (and all the time when the boys are here), so I’m constructing a simple wall mounted charging station. The design is pretty basic. It is just a couple of shelves to hold iPads and phones. No hand cut dovetails or drawers. No back. About as simple as you can get. The first step was to pull out a piece of cherry. The board I pulled out of the loft was about twice as much wood as I needed, but I didn’t feel like digging for a smaller board. Anyway, I have lots and lots of cherry, so no need to stress. Rough cherry board for today’s project. I milled (half of) the board into two sides that are 5″ wide and 30″ long. I milled the lumber to a little less than 3/4″ thick – I think it will look nicer just a little lighter than the normal 3/4″. The sides taper from 5″ wide at the bottom to 4″ wide at the top. I milled four shelves at the same time, varying from 4 1/2″ to 3 1/2″ in width and about 12″ long. 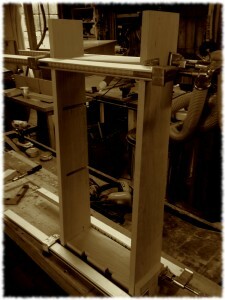 I clamped the sides together (back to back) and cut four stopped dadoes for the shelves. The dadoes are 3/8″ wide – I picked it because 1/4″ seemed too small, and 1/2″ seemed to wide and I happened to have a 3/8″ router bit. I set up the router table to cut the tenons to go into the dadoes. I was wanting to use the table saw, but my dado blades had a carbide tooth fall off (so I’m stuck having to get the blade repaired or order a new dado stack). Anyway, the router table worked fine. Finally, I cleaned up the tenon cheek with a hand plane and chisels. I cut off the front of the tenon (for the stopped portion of the dado) with a hand saw and glued up the sides and the top and bottom shelf. I’ll add the two middle shelves tomorrow. I can’t do much work in the shop while the varnish dries on the toy boxes. This is the first real project I’ve made from cherry (I made a bookshelf from cherry veneered plywood but that doesn’t count). I can see why everyone likes cherry – it is an easy wood to work with. My hand tools love cherry. It isn’t as soft as pine, but it is much easier on the tools (and me) than oak. Charging station glue up. The middle shelves will be fit into the case tomorrow.